Relax and enjoy the service and accommodation at Tanawit Hotel & Spa – 71-room hotel in Hua Hin, where rooms feature modern conveniences and views of the city. Rooms can be rented for long stretches of time, making it a prime location for both business and leisure travelers. 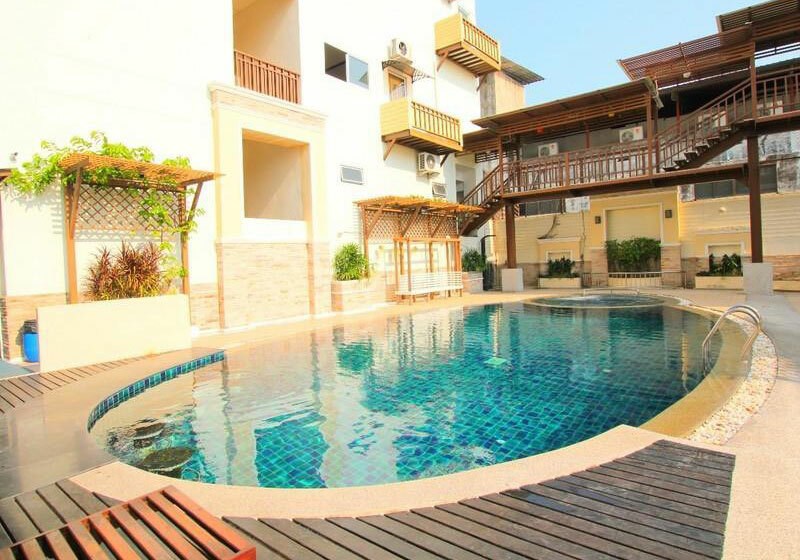 Tanawit Hotel & Spa features include a terrace restaurant serving traditional Thai and international cuisine at reasonable prices and a rooftop pool with a bar serving light refreshments. Nearby attractions include exclusive golf courses, the beach, and some of Thailand’s best seafood restaurants. Situated two hours out of Bangkok, Hua Hin is the perfect escape for those yearning for a romantic or relaxing break from hectic city living. Short Description: Relax and enjoy the service and accommodation at Tanawit Hotel & Spa - 71-room hotel in Hua Hin, where rooms feature modern conveniences and views of the city. Rooms can be rented for long stretches of time, making it a prime location for both business and leisure travelers.